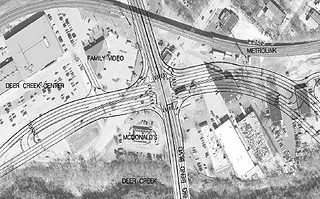 “We’re a highway department; we’re not a bicycle department.” This is how a spokesperson for the St. Louis County Department of Highways and Traffic decided to deride opposition to the proposed South County Connector project. The statement, offered to reporter Michael Calhoun of KMOX, is both revealing and a display of stunning ignorance. There is no bicycle department in St. Louis County, nor a pedestrian department, nor a quality of life department, though there should be. The Department of Highways and Traffic, however, does exist within an environment that includes these unformalized concerns. Nearly every cyclist is also a motorist. Nearly every pedestrian also travels in a car. The idea that a highway is a highway, nothing more and nothing less, insulated from other concerns is myopic, dysfunctional and untrue. The statement above reveals that not only is there not a “bicycle department,” but that the Department of Highways and Traffic will refuse to acknowledge the voices of those who it would derogatorily label as such. In its espoused worldview, municipalities and concerns other than level of service (for cars) and traffic throughput are obstacles to be first avoided, then dismissed and likely next attacked. Elsewhere on the Network today: Reconnecting America discusses the connections between transportation, neighborhood form, and the obesity epidemic. Greater Greater Washington considers whether DC should prioritize projects that help people access downtown or travel between neighborhoods. And Exit 133 explains why recycling can work better in compact, urban areas.